A new statistical technique, analysing data records since measuring started 150 years ago, independently confirms that man-made carbon dioxide (CO2) and methane (CH4) emissions have led to global warming, according to a JRC-led article published Nature Scientific Reports. The analysis also shows that the most pronounced consequences of such emissions are being felt in localised regions around the globe, such as Europe, North America, China, Siberia, the Sahel zone in Africa, and Alaska. The authors investigated the causes of global warming using a new statistical method for quantifying causality to analyse the relation between time series data on greenhouse gas emissions and those on air temperatures in the last 150 years. The results confirm that recent global warming is mainly caused by increased anthropogenic (man-made) emissions and that further CO2 emissions to the atmosphere will lead to even stronger global warming. This conclusion cannot be achieved through traditional, time-delayed correlations between temperature and GHG emissions changes or through ordinary least square regression analysis, as neither shows the causal relations. Being based on measured data, the results provide complementary support to model-based studies. The authors applied the same technique to analyse historical air temperatures and CO2/CH4 data from the past 800,000 years, available thanks to the 3,000 meter deep ice core drilled in Antarctica more than a decade ago, which offers scientists a clue on a time scale of 800 millennia. They found a causal relationship between temperature increase and rising CO2/CH4 levels, which is the exact opposite of the results for the last 150 years. This also confirms the validity of the technique, as it is well known from the ice core data that in historical times, increase of temperatures had been followed by higher CO2/CH4 emissions. The causality relationship appears to have started reversing around 5000 years ago. The analysis confirms this opposite trend for the last 150 years, when unprecedented amounts of CO2 started being pumped into the atmosphere in the industrial age. Looking into the effect of anthropogenic emissions on different regions, the authors found strong causality between greenhouse gas emissions and rising temperatures in Europe, North America and China, where densely populated and industrialised areas have shown signs of strong warming. However, a high degree of causality was seen also in Siberia, the Sahel zone in Africa and Alaska, where human presence and associated activities are far less intense. The reasons for this pattern are not yet understood and should therefore become the focus of research to better understand regional climate dynamics. 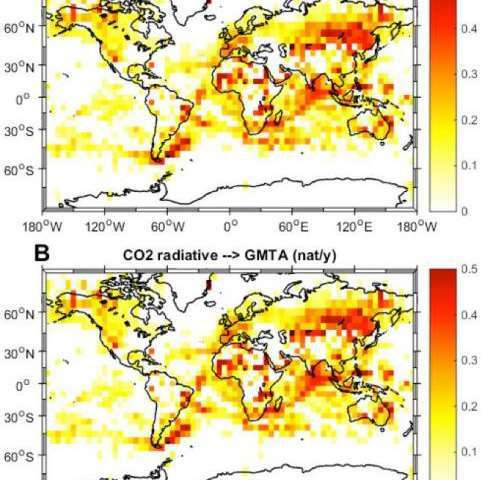 This observational data-based study, therefore, not only provides complementary support for the results of modelling activities on global climate, but also indicates that further research should be carried out in regions of increased sensitivity to global warming caused by anthropogenic activities. The study was carried out in cooperation with a colleague from China's School of Marine Sciences, Nanjing Institute of Meteorology, who developed the statistical method. "Reversed 5000 years ago ..." That's seems to be a big contradiction, unless those pesky aliens exhaled a lot of CO2. "In highly populated areas" logical, because we emit a lot of CO2, but wait also in extremely low populated areas, err, we need more research (that means we have no clue). Isn't it ironic then, that we have astronauts in training who will travel to the planet Mars, where the atmosphere is 95.97% CO2 and unbreathable, a volume which is far worse than any that humanity will ever experience here on Earth? If GB is caused by humans burning fossil fuels in order to keep warm during cold weather, why haven't the alternative methods such as fusion materialized yet in spite of all the advertising for years already, that the technology is almost perfected? Where is it? One would think that if GB was that serious a problem, that a solution would have been found by now to help eliminate the CO2 and CH4 from the air and waters. Maybe we should plant more trees and vegetation to absorb that which we are emitting? The only other thing is to eliminate a percentage of the human and animal populations who are the offending cause of GB. In that case, war in the Middle East is quite effective for removing some while others survive. Sad as it is. POSTED ON NOVEMBER 2, 2015 AND FILED UNDER E-CAT,LENR,NEWS,ROSSI. "It is easy to see why a lot of people do not take Andrea Rossi very seriously. He has made yet another round of sensational yet unsubstantiated claims about his E-cat low energy nuclear reaction (LENR) technology. In an interview with Frank Acland that popped up on e-catworld.com on October 25, 2015, Rossi said "yes" when Acland asked: "Have you had any orders so far from well-known companies?" Unfortunately Acland forgot to ask the next logical question which is: "can you identify those companies?" Since Acland did not ask the question, the response above is absolutely meaningless. Even if Rossi refused to identify the companies that would at least be a response. It would also be news." Many people are now believing that Rossi is a fraud and a scam artist who is getting rich from gullible people. A lot of people are now saying that Andrea Rossi appears to be a fraud and a scam artist. I don't think his LENR is able to be perfected and his "research" will continue for as long as he can fool enough investors into supporting not only his research, but his lifestyle. He's got quite a racket going. @freelam: "we have no clue". Yes, that relationship has long been noted and used by anti-science trolls. We have had the clue ever since the GW effect was discovered, the question is what is the forcing when. I.e. before ~ 8000 kyrs there were no farming, so temperature forced CO2/CH4 (which reinforced heat), now CO2/CH4 release is forcing heat (so temperature; and of course there is a problematic feedback of nature again releasing stored CO2/CH4 as a response). Local anomalies has never been problematic for observing *global* climate changes. - "This new method is based on the information flow (IF) concept31. The whole new formalism is derived from first principles, rather than as an empirically defined ansatz, with the property of causality guaranteed in proven theorems. This is in contrast to other causality analyses, say that based on Granger causality25,33,34 or convergent cross mapping (CCM)35. The resulting formula is concise in form, involving only the common statistics, namely sample covariances. It also allows an explicit discrimination between correlation and causality: causation implies correlation, but not vice versa." So it is truly self contained, model independent. - They can eliminate other forcing (or at least volcanic) in the local anomaly regions the new method picks up. Moar and new science! ",,, on very long time scales (800,000 years) the IF [see above; my note] is only significant in the direction from air temperature to CO2. This supports the idea that the feedback of GHGs to temperature changes seems to be much slower than the fast response of temperature to changes in GHG." -Not really. Everyone is very eager to find those 900 ft tall glassy-headed Martians that you spotted lying down in the Martian dust in a NASA photo.